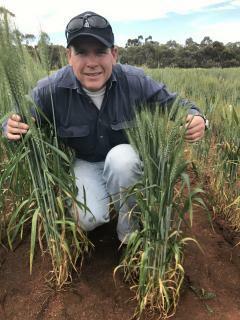 DPIRD senior research officer Dr Michael Francki evaluating a wheat trial as part of a SNB resistance research project at Northam. (July 4, 2018) - Wheat researchers have discovered a combination of genes that provide resistance to the significant fungal disease Stagonospora nodorum blotch (SNB) in Western Australian varieties. The discovery was made as part of a research project by the Department of Primary Industries and Regional Development and the State Agricultural Biotechnology Centre at Murdoch University, with funding from the Grains Research and Development Corporation (GRDC). SNB costs Western Australian growers about $108 million per annum, due to leaf death and reduced grain fill – particularly in high rainfall areas and wet years. Senior research officer Michael Francki and his team have been evaluating germplasm, including United States’ winter wheat, Australian lines and other international wheat lines sourced via the GRDC’s CAIGE project. Dr Francki says field trials at the department’s Northam and Katanning Research Facilities helped researchers to identify resistant genes. The department recently planted additional field trials in the new netted field plots at its Northam Grains Research Facilities, as well as its Manjimup Research Facility – where conditions are expected to be more conducive to the SNB pathogen. The department has also provided the genetic markers and germplasm to commercial wheat breeding companies to accelerate their use in the development of new varieties. Department researchers intend to continue evaluating germplasm from a range of sources, from as far away as Norway, for genes that are resistant to SNB. The team is also using the draft wheat genome to identify causal genes for SNB resistance, which will be used as diagnostic DNA markers to further improve the selection efficiency of gene combinations in commercial wheat breeding.